Sporty stopwatch with large LCD. In sturdy plastic case for storage. Slit design on sides for better grip. With Calendar mode which displays day, month, and date. With 12 or 24 hour clock format. Accumulated elapsed time and split time measurements. Winner Digital Precision Stopwatch, W-999 is a premium quality Stop Watches from Winner. Moglix is a well-known ecommerce platform for qualitative range of Stop Watches. All Winner Digital Precision Stopwatch, W-999 are manufactured by using quality assured material and advanced techniques, which make them up to the standard in this highly challenging field. The materials utilized to manufacture Winner Digital Precision Stopwatch, W-999, are sourced from the most reliable and official Stop Watches vendors, chosen after performing detailed market surveys. Thus, Winner products are widely acknowledged in the market for their high quality. 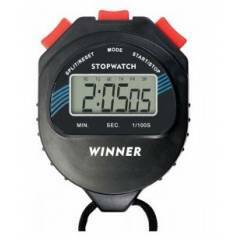 We are dedicatedly involved in providing an excellent quality array of Winner Stop Watches.